As we wrap up our 20 Days of Trouble, we saved the best for last. Or at least one of the most important. If you like what you see, be sure to check out the entire 20 Days of Trouble Study on our Free Gifts page. This wasn’t the world he’d grown up in. Things were changing and it wasn’t for the better. Right was wrong and wrong was right. Light was becoming darker more quickly and Michael felt completely helpless to do anything about it. “Has everyone lost their minds?” he wondered out loud. He promised himself no more news, but he couldn’t help it. He was immediately sorry he’d turned the television on. Each time he listened, Michael was more convinced of the impending doom. He loved his kids and grandkids with all his heart and wanted the best for them, yet, instead of excitement for their future, he was consumed with fear and dread. Panic gripped her heart. Her limbs went numb and the room began to spin. Her young daughter hadn’t been feeling well. Never one to worry, Deena didn’t expect it to be anything much. The symptoms were troublesome, but there hadn’t been a sense of urgency or alarm. Until now. Deena saw it in the doctor’s eyes. She watched him stumble for the right words. She saw his head drop. Fear took on a new meaning. Struggling to catch her breath, she waited for the doctor to continue. We have a friend that asks us frequently, “Are you living in faith or fear?” Logically, these can’t coexist, and of course ‘faith’ is the answer we desire. But it isn’t always reality. There is nothing that will drop me to my knees faster than fear. Well, the truth is it’ll send me to the bathroom first, but that didn’t sound quite as powerful! Are you surprised at this eclectic list? Its crazy how differently we’re all wired, isn’t it? And as you know, there are many, many more. So what’s a Christian to do? Fear delivers a destructive one-two punch. Not only are we held hostage to whatever is causing us to be afraid, but then we have guilt for being afraid in the first place. Yup, that’s about as easy as allowing a driverless car to drive you around a busy city in the middle of rush hour on a Friday afternoon. God is perfect and the self-driving car is not. Well, that’s just one difference, but you get the point. We must learn to trust God, even when it’s scary. Our sin natures allows for fear to enter in. Fear is the norm and it’s up to us to fight against it; to take a stand and not allow it to take root in our lives. We must make an intentional effort to fight against this debilitating stronghold. Without containment, fear will move in and permanently park. Think of all the experiences and joy you will miss when paralyzed by fear. The job you’re too afraid to accept. The medical test you’re too afraid to take. The relationship you’re too afraid to allow. The trip you’re too afraid to book. The sport you’re too afraid to try. The conversation you’re too afraid to have. The accountant you’re too afraid to speak with. The business you’re too afraid to start. Now, in all fairness, sometimes when we’re afraid our concerns are legitimate and well-founded, so it’s important not to go off half-cocked and haphazard before thoroughly dissecting and analyzing an important decision. Sometimes red warning flags are waving for our protection. Proceed with a willingness to look at all facets of a situation and make a thoughtful, intentional decision. Fear is useful for just about 4.3 seconds! It can alert you to real danger, like smelling smoke when there’s a fire, but after acknowledgment, it’s time to take action! 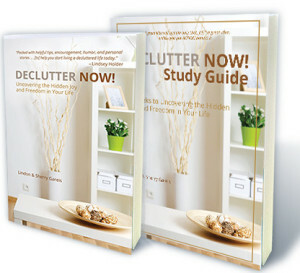 Decluttering fear can be a daunting task. When warning signs are going off in our heart and head, it’s hard to reset in the case of a false alarm, but as the definition suggests, fear can be imagined. There may not necessarily be a threat. And even if the threat is real, fear can be so consuming that we are often rendered useless. Neither of these scenarios are helpful. Asking two simple questions can help set the pace for a better end result. (1) Make an accurate assessment – Is the threat real or imagined? When fear is present, reject irrational or kneejerk emotional responses. Instead, take a deep breath and embrace a logical and intentional approach. I may not like flying any more today than I did yesterday (and that’s a serious understatement), but I don’t allow fear to control my life and steal my joy. What fear is on your list to declutter? Make a decision to extinguish it today! This entry was posted in Inspirational, Self-help, Uncategorized and tagged career, death, declutter, fear, God, health, job, medical, money, scared, trouble, unhappy. Bookmark the permalink.